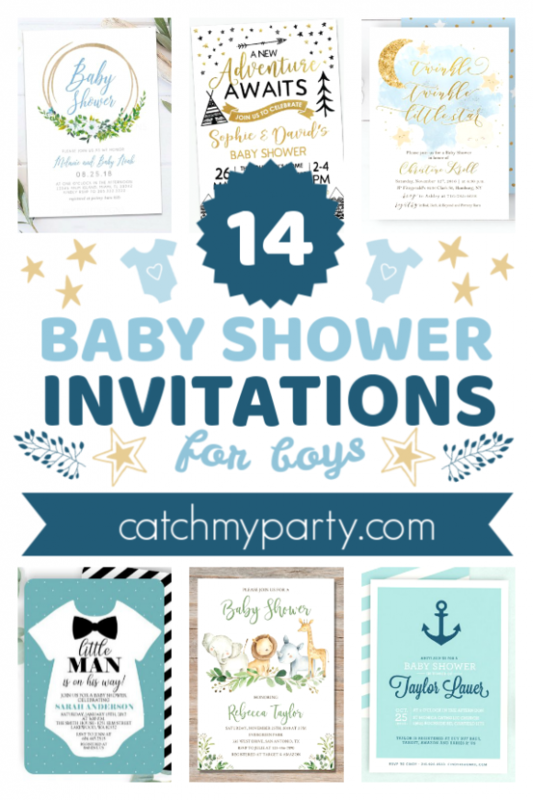 You'll find the most adorable invitations for many boy baby shower themes such as a nautical baby shower, a jungle baby shower, a prince baby shower and many more... Enjoy! 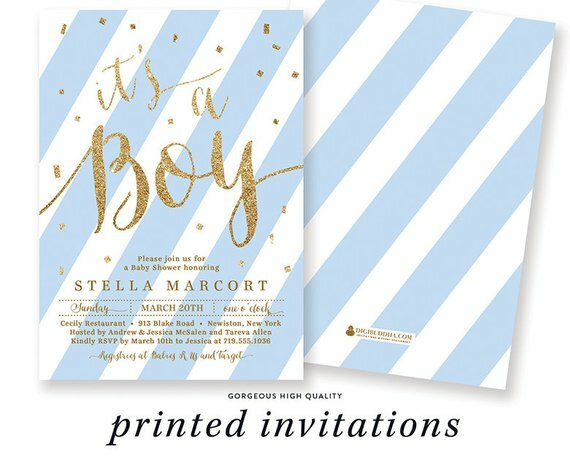 The 14 Most Adorable Baby Shower Invitations for Boys! Just as pink is the traditional color for a girl, blue is recognized as the color of choice for a baby boy. 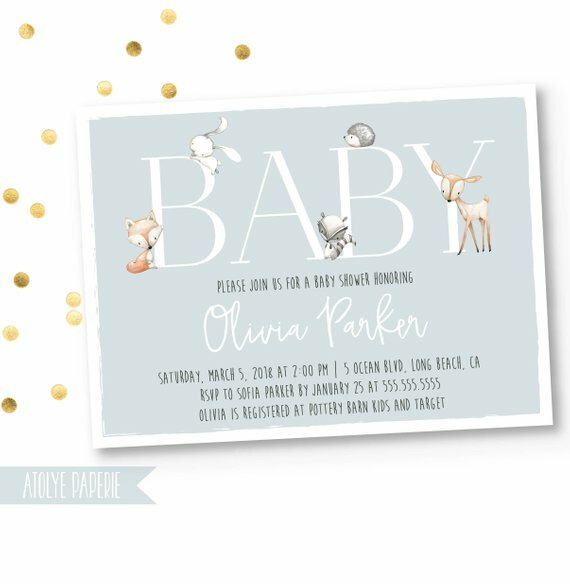 So, with that in mind, we are starting off our list of boy baby shower invitations with a very slick blue suggestion that will definitely grab your guests' attention. The design is modern and incredible stylish. Just what you need! 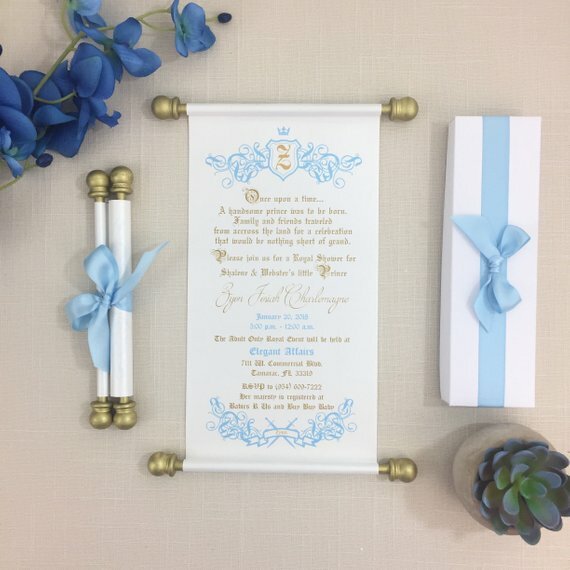 One of the most popular boy baby shower themes has to be a royal prince baby shower, and no invitation could be more perfect then this scroll invitation that is presented to you guests in a pretty box with a beautiful blue bow. Just imagine the look on their faces when they open the box to see they have been invited to such a regal event! 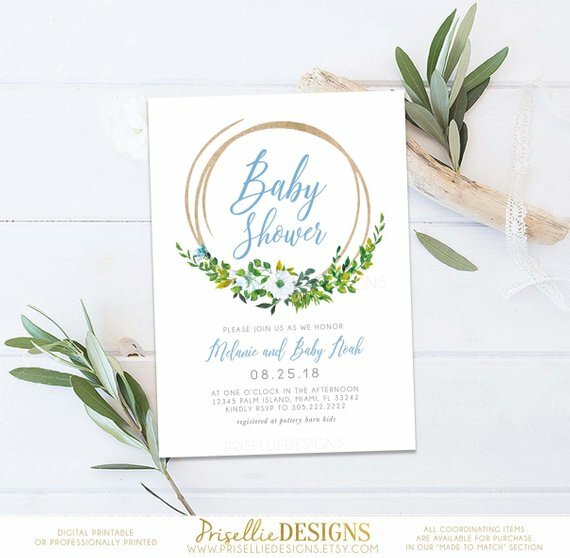 If you're looking for something simpler and more in tune with nature, then a rustic baby shower maybe just what you're looking for. This invitation is so pretty with wonderful typography and beautifully illustrated greenery and flowers. I love it! 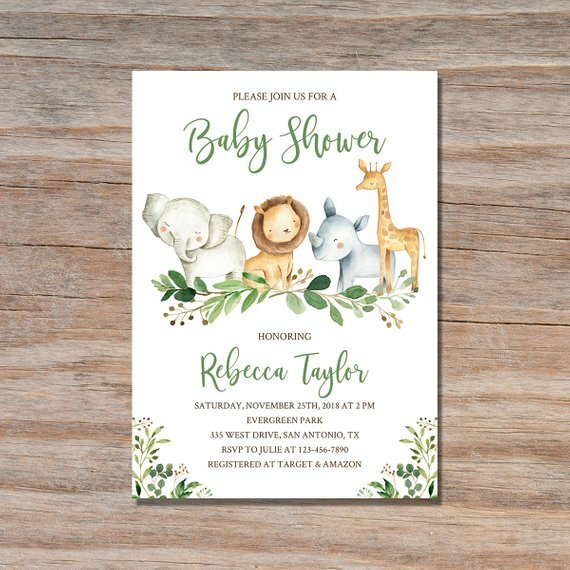 Baby woodland animals are so cute and make an amazing baby shower theme for both boys and girls. This gorgeous woodland boy baby shower invitation makes your heart melt. Just look at all the wonderful animals in and around the letters. Simple in design but in this case more is less and this invitation is truly adorable! 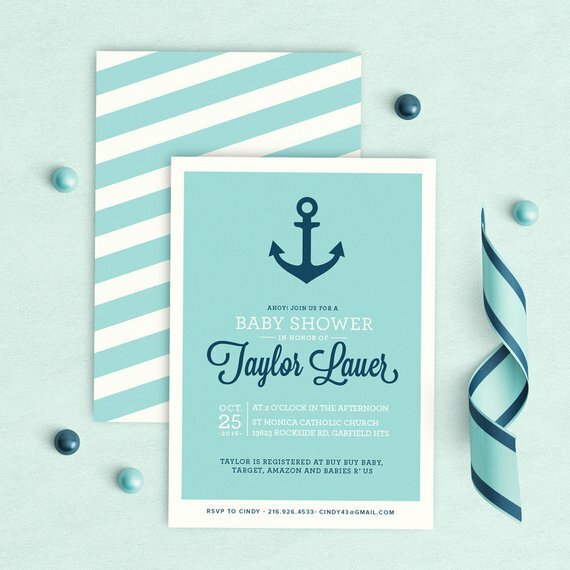 If you're more into a nautical themed boy baby shower, then don't miss this very blue baby shower invitation. It is perfectly designed with stunning typography and dark blue anchor. Love the diagonal striped flip side of the invitation. 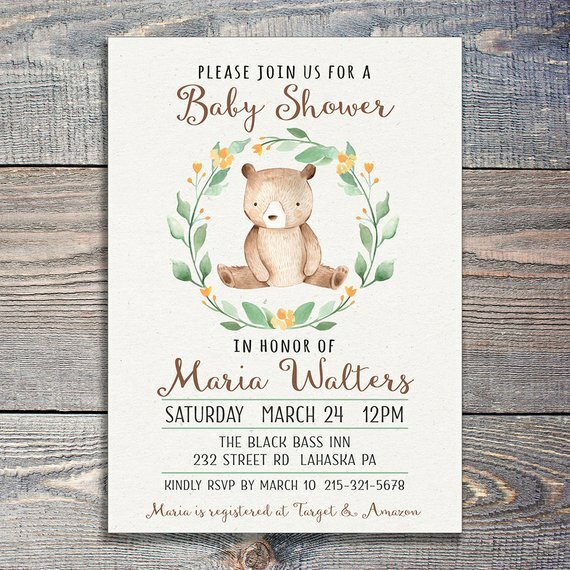 This teddy bear baby shower invitation is another adorable choice. A teddy bear can be a much loved little boy's best friend. You only have to think of Winnie the Pooh and Christopher Robin, and their special bond comes to mind. A little boy's love for his teddy is such a heart warming relationship that it definitely makes for a wonderful boy baby shower theme, don't you agree? What a better way to celebrate your little man then going with the most obvious choice of a boy baby shower theme... little man! 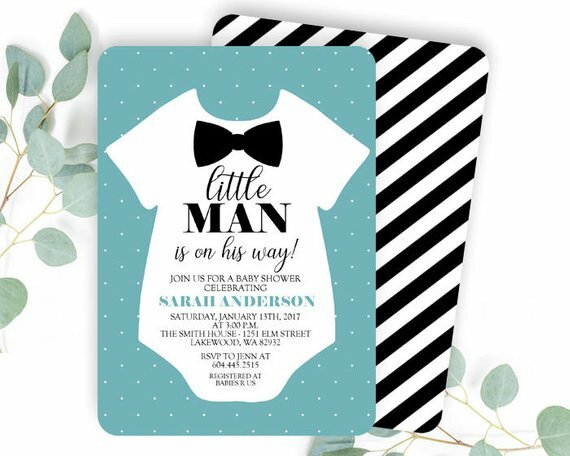 This little man baby shower invitation is so much fun with the little cute onesie and the black bow tie. It just oozes style! Nothing is more precious, although sometimes it may not feel like it, then those in the middle of the night nursing encounters with your newborn baby. The bond you form with your child is such a magical one, that during the night is only witnessed by the moon and stars. 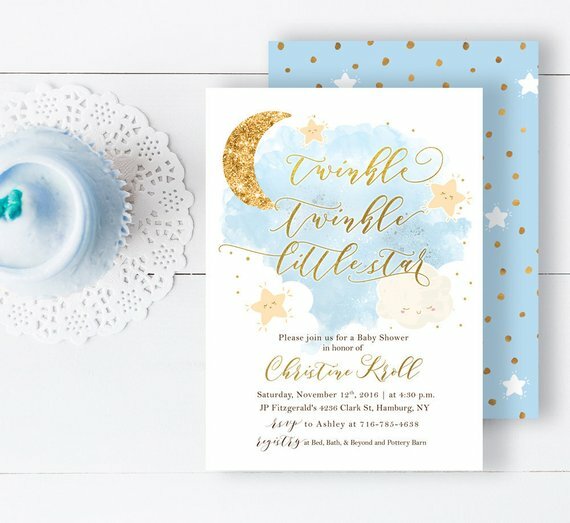 Nothing shines brighter in your world then your little baby, which is why this twinkle twinkle little star boy baby shower invitation is such an adorable choice. 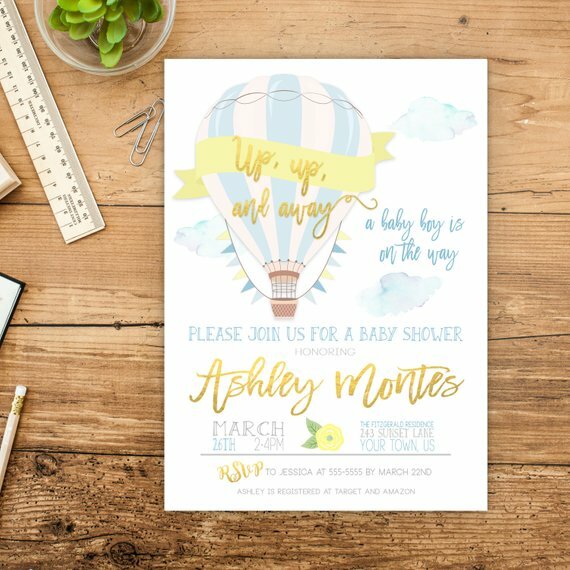 Take your celebration to new heights with a hot air balloon themed baby shower. It's such a gorgeous theme that is also very popular and allows you to add a vintage touch to your party. 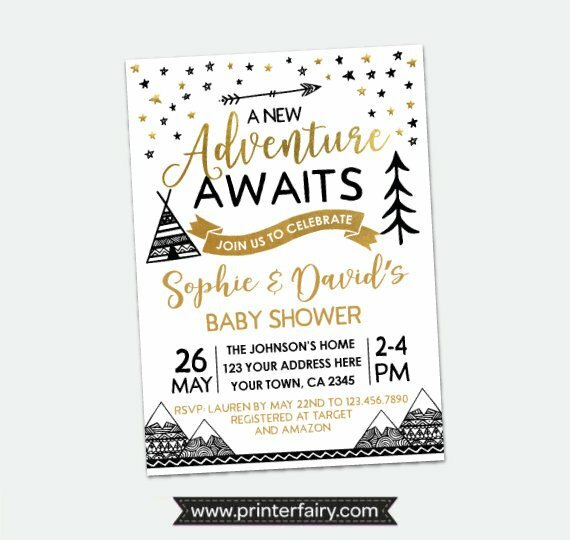 A newborn child is always an adventure, so why not embrace it and go with a boho tribal themed boy baby shower. This black and gold deign of the invitation works so well and you can bet your guests will be waiting with baited breathe to join in the celebrations. Just as popular as a woodland theme, a jungle baby shower is also a big hit with boys. The illustrations of jungle animals on this invitation are so cute and beautifully done. Everything about this invitation is perfect! If you're a football crazy family then a football boy baby shower has to be your theme of choice! 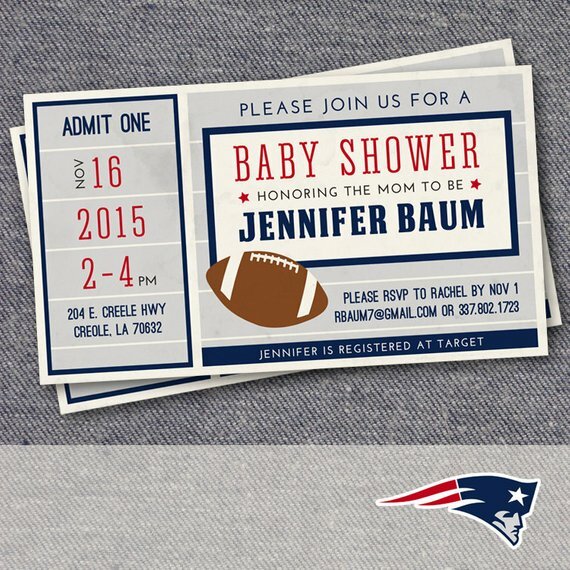 These vintage ticket football baby shower invitations are so cool! What's not to love about them? Everyone loves Mickey Mouse so a Mickey Mouse boy baby shower is a magical option is you're a life long Disney fan. 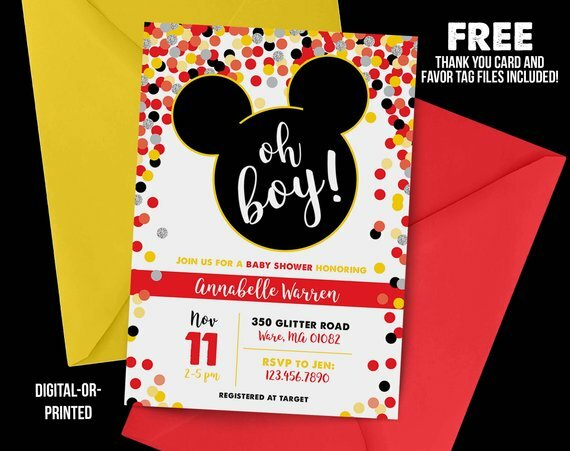 This Mickey baby shower invitation is such a fun blast of color. Just what you need to if you want to spread some Disney magic. The final boy baby shower invitation on our list just has to be a lumberjack themed one! It's also such a popular themed for a 1st birthday. 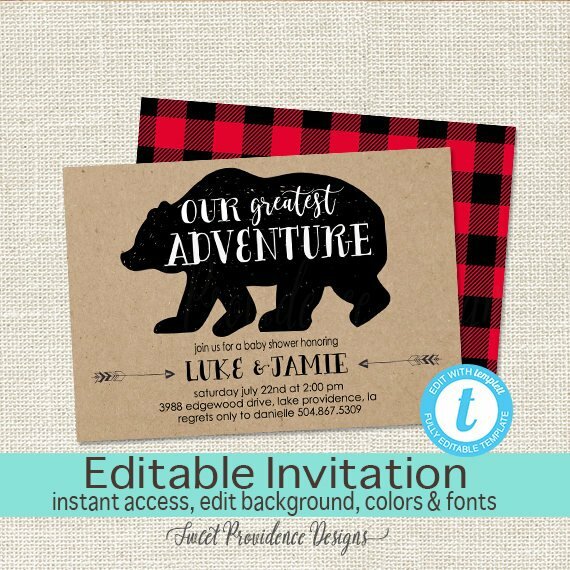 This bear illustrated invitation is fantastic. Love the red and black plaid flip side. It has such a manly rustic feel, don't you think?